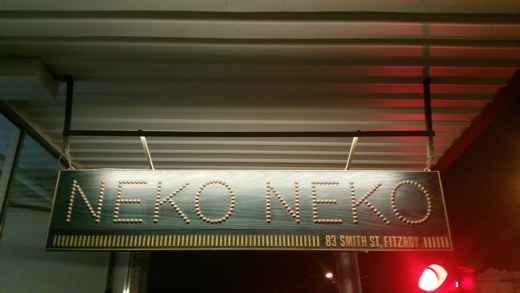 We've been meaning to check out Neko Neko for ages and a cold Wednesday night with a few friends was the perfect opportunity. We turned up at about 7 and had to wait for about 20 minutes to get a table for four. They only have seats for about 20 people and they're pretty popular, so I'd guess a wait is pretty standard. Once they squeezed us in we sussed out our options. 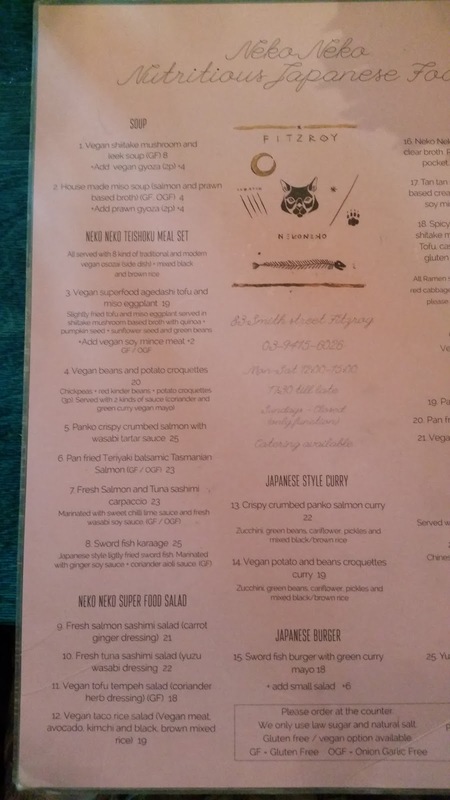 Neko Neko serves a bit of fish, but they're super vegan friendly - there are meal sets, ramen, curry and a bunch of other superfood-y things like raw okonomiyaki (whatever that is). 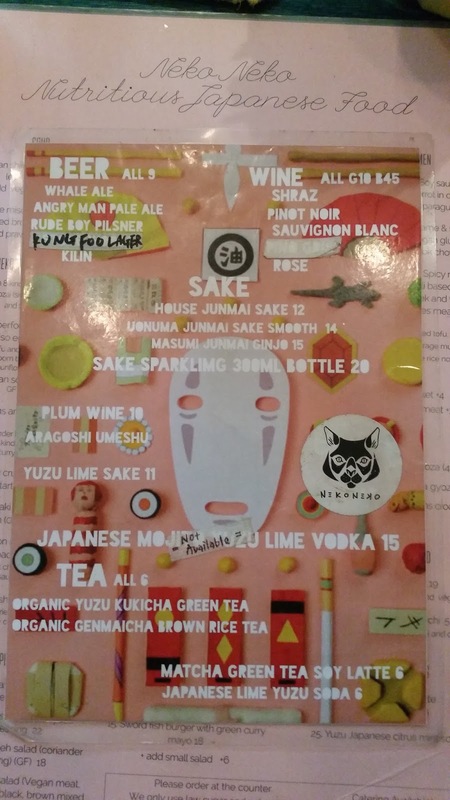 I only had eyes for ramen - there are three options: one with a soy sauce based broth, a creamy tan tan ramen and my choice: spicy tofu ramen. 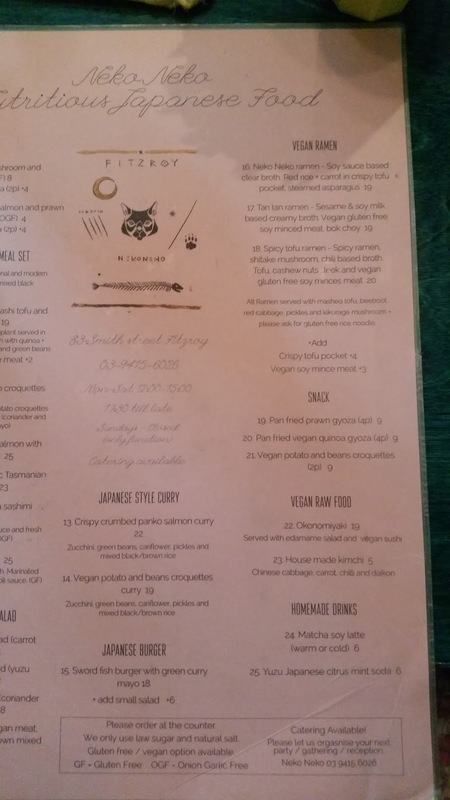 It comes with shitake mushrooms, chilli broth, tofu, cashew nuts, leek and vegan soy mince plus the standard sides of pickles, mashed tofu, cabbage and beetroot ($20). It's far from an authentic Japanese ramen - I'm pretty sure the spiciness comes from Sechuan peppers - but it was utterly fabulous. This is perfect winter food - great noodles, loads of other goodies and a hot, spicy broth. Cindy went for one of the meal sets - the agedashi tofu and miso eggplant set, with eight side dishes plus rice ($19). It's super impressive visually - the big plate of sides looked amazing. 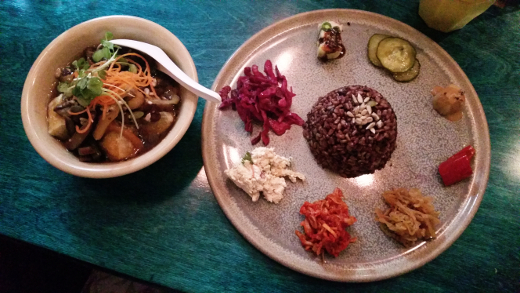 There are various pickles, soft cashew mush, tofu salad, a little potato and a big serving of red rice in the middle. The agedashi tofu and miso eggplant came alongside, in a rich mushroomy broth and was an excellent accompaniment. 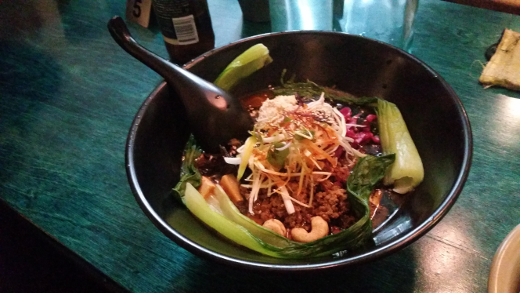 Neko Neko is a great winter option along Gertrude Street. Having to wait in the cold for a table makes it a slightly harder sell, but once you're in you get delightfully warming food and a buzzy, bustling vibe. 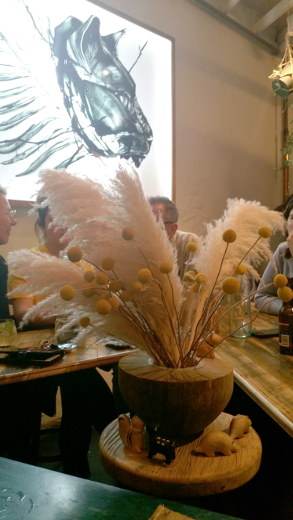 The service isn't super slick, but it was efficient enough and the food is totally worth it. We'll be back. Neko Neko has received positive reviews on vego blogs messy veggies, Future King and Queen and little vegan bear as well as omni blogs Whatever Floats Your Bloat, DonutSam Eats and Travels, Fitzroyalty and Wandering Mint. Accessibility: There's a small step up on entry and the interior is super crowded. We ordered and paid at a low counter and didn't visit the toilets. Wow, the agedashi tofu and miso eggplant dish looks so good! Want to try! It was so warm and comforting, I would definitely recommend it!